Russian women working in city factory at the height of the Siege of Leningrad. 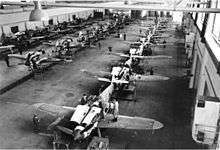 Assembly line of Messerschmitt Bf 109G-6s fighters in a German aircraft factory. 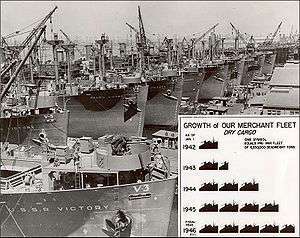 Military production during World War II includes the arms, ammunitions, natural resources, personnel and financing which were mobilized for the war. Military production, in this article, means everything produced by the belligerents from the occupation of Austria in early 1938 to the surrender and occupation of Japan in late 1945. The mobilization of funds, people, natural resources and matériel for the production and supply of military equipment and military forces during World War II was a critical component of the war effort. During the conflict, the Allies outpaced the Axis powers in most production categories. Access to the funding and industrial resources necessary to sustain the war effort was linked to their respective economic and political alliances. As formerly neutral powers (such as the United States) joined the escalating conflict, territory changed hands, combatants were defeated, the balance of power shifted in favour of the Allies (as did the means to sustain the military production required to win the war). German poster entitled "Designing and Building the East". During the 1930s, political forces in Germany increased their financial investment in the military to develop the armed forces required to support near- and long-term political and territorial goals. Germany's economic, scientific, research and industrial capabilities were one of the most technically advanced in the world at the time and supported a rapidly growing, innovative military. However, access to (and control of) the resources and production capacity required to entertain long-term goals (such as European control, German territorial expansion and the destruction of the USSR) were limited. Political demands necessitated the expansion of Germany's control of natural and human resources, industrial capacity and farmland beyond its borders. Germany's military production was tied to resources outside its area of control, a dynamic not found amongst the Allies. In 1938 the British Commonwealth was a global superpower, with political and economic control of a quarter of the world's population, industry and resources. From 1938 to mid-1942, the British coordinated the Allied effort in all global theatres. They fought the German, Italian, Japanese and Vichy armies, air forces and navies across Europe, Africa, Asia, the Middle East, India, the Mediterranean and in the Atlantic, Indian, Pacific and Arctic Oceans. British forces destroyed Italian armies in North and East Africa and occupied overseas colonies of occupied European nations. Following engagements with Axis forces, British Empire troops occupied Libya, Italian Somaliland, Eritrea, Ethiopia, Iran and Iraq. The Empire funded and delivered needed supplies by Arctic convoys to the USSR, and supported Free French forces to recapture French Equatorial Africa. Britain also established governments in exile in London to rally support in occupied Europe for the Allied effort. The British defeated, held back or slowed the Axis powers for three years while mobilizing their globally integrated economy and industrial infrastructure to build what became, by 1942, the most extensive military apparatus of the war. This allowed their later allies (such as the United States) to mobilise their economies and develop the military forces required to play a role in the war effort, and for the British to go on the offensive in its theatres of operation. The entry of the United States into the war in late 1941 injected financial, human and industrial resources into Allied operations. The US produced more than its own military forces required and armed itself and its allies for the most industrialized war in history. At the beginning of the war, the British and French placed large orders for aircraft with American manufacturers and the US Congress approved plans to increase its air forces by 3,000 planes. In May 1940, Franklin D. Roosevelt called for the production of 185,000 aeroplanes, 120,000 tanks, 55,000 anti-aircraft guns and 18 million tons of merchant shipping in two years. Adolf Hitler was told by his advisors that this was American propaganda; in 1939, annual aircraft production for the US military was less than 3,000 planes. By the end of the war US factories had produced 300,000 planes, and by 1944 had produced two-thirds of the Allied military equipment used in the war—bringing military forces into play in North and South America, the Caribbean, the Atlantic, Western Europe and the Pacific. The U.S. produced vast quantities of military equipment into late 1945, including nuclear weapons, and became the strongest, most technologically advanced military forces in the world. 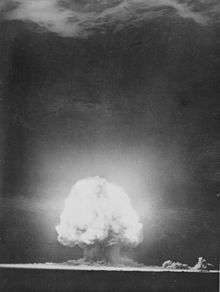 In addition to out-producing the Axis, the Allies produced technological innovations; through the Tizard Mission, British contributions included radar (instrumental in winning the Battle of Britain), sonar (improving their ability to sink U-boats), and the proximity fuze; the Americans led the Manhattan Project (which eliminated the need to invade Japan). The proximity fuze, for example, was five times as effective as contact or timed fuzes and was devastating in naval use against Japanese aircraft and so effective against German ground troops that General George S. Patton said it "won the Battle of the Bulge for us." The human and social costs of the war on the population of the USSR were immense, with combat deaths alone in the millions. Recognising the importance of their population and industrial production to the war effort, the USSR evacuated the majority of its European territory—moving 2,500 factories, 17 million people and great quantities of resources to the east. Out of German reach, the USSR produced equipment and forces critical to the Axis defeat in Europe. Over one million women served in the Soviet armed forces. Assembly line production of fighter aircraft near Niagara Falls, New York. The statistics below illustrate the extent to which the Allies outproduced the Axis. 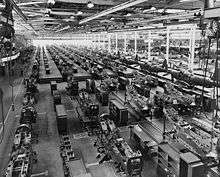 Production of machine tools tripled, and thousands of ships were built in shipyards which did not exist before the war. According to William S. Knudsen, "We won because we smothered the enemy in an avalanche of production, the like of which he had never seen, nor dreamed possible." 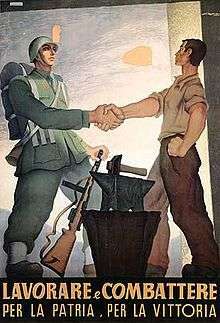 Access to resources and large, controlled international labour pools and the ability to build arms in relative peace were critical to the eventual victory of the Allies. Donald Douglas (founder of the Douglas Aircraft Company) declared, "Here's proof that free men can out-produce slaves." In thousands of international dollars, at 2014 prices. During the war, Romania built the minelayer Amiral Murgescu, the submarines Rechinul and Marsuinul, a class of four minesweepers, a class of two gunboats and completed six British Power Boat motor torpedo boats. 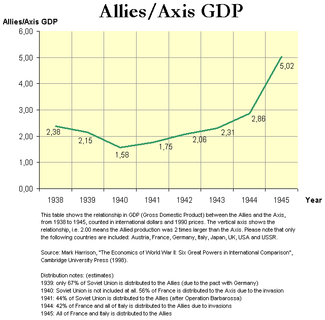 The relationship in GDP between the major Allied and Axis powers 1938-1945. GDP provides insight into the relative strength of the belligerents in the run up to, and during the conflict. Romanian, Hungarian, Bulgarian and Albanian GDP calculated by multiplying the GDP per capita of the four countries in 1938 ($1,242 for Romania, $2,655 for Hungary, $1,595 for Bulgaria and over $900 for Albania) by their estimated populations in 1938: 19,750,000 for Romania, 9,082,400 for Hungary, 6,380,000 for Bulgaria and and 1,040,400 for Albania. ↑ Billions of international dollars, at 1990 prices. Adjusted annually for changing compositions within each alliance. USSR to Allies: 1941:44% (light green), 1942-1945:100%. The Allied and Axis totals are not the immediate sum of the table values; see the distribution rules used above. Including all non-British subjects in British services. Auxiliary units include Home Guard, Reserves, Police regiments, etc. Including all non-German subjects in German services. Auxiliary units include Home Guard, Wehrmachtsgefolge, Reserves, Police regiments, etc. Within the UK, initially aircraft production was very vulnerable to enemy bombing. To expand and diversify the production base the British setup "Shadow factories". These brought other manufacturing companies - such as vehicle manufacturers - into aircraft production, or aircraft parts production. These inexperienced companies were set up in groups under the guidance or control of the aircraft manufacturers. New factory buildings were provided with government money. 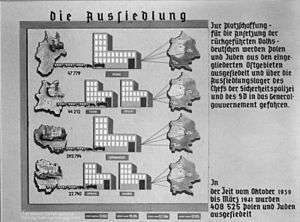 Production numbers until the time of the German occupation of the respective country. Some types listed were in production before the war, those listed were still in production at the time of or after the Munich crisis. Occupied countries produced weapons for the Axis powers. Figures are for the period of occupation only. Focke-Wulf Ta 152 & Focke-Wulf Ta 154 200 these are unrelated types. Vichy France poster: "At work in Germany you are an ambassador of French quality"
USSR: "Everything for the Front. Everything for Victory"
French-Canadian poster: "I'm making bombs and buying bonds!-Buy Victory Bonds." Italy: "Work and Fight for your Country and Victory"
Australia: "He's coming south—it's fight, work or perish"
↑ Pre-war production. 165 additional to export customers. Sea Gladiator conversions and production listed in Sea Gladiator entry. ↑ First prototype incomplete by German occupation. ↑ Only 1 (designated P.11g) used by Poland in 1939. The remaining ones were exported to various Balkan countries. ↑ Around 200 more airframes were in advanced production stage. ↑ Production was started in Denmark, but not completed before the German invasion. ↑ Originally an advanced fighter-training aircraft, this type was later used as a light attack plane, in particular by the Air Force of the Independent State of Croatia. ↑ According to some sources license production started in Denmark but not completed before the German invasion. ↑ All but 5 delivered to Bulgaria. ↑ Prototypes that were used in combat. 1 2 3 Number refers to production resumed after German occupation. ↑ Produced shortly before the war and mainly used for testing and propaganda purposes. ↑ Produced before the war and 2 used by Japanese for testing. ↑ All produced before the war, but used until 1944. ↑ Produced for Germany after German occupation. ↑ Only bomber versions listed here. ↑ Herman, Arthur. Freedom's Forge: How American Business Produced Victory in World War II, p. IX, Random House, New York, NY, 2012. ISBN 978-1-4000-6964-4. ↑ Parker, Dana T. Building Victory: Aircraft Manufacturing in the Los Angeles Area in World War II, p. 7, Cypress, CA, 2013. ISBN 978-0-9897906-0-4. ↑ Wrynn, V. Dennis. Forge of Freedom: American Aircraft Production in World War II, pp. 4-5, Motorbooks International, Osceola, WI, 1995. ISBN 0-7603-0143-3. ↑ Sawyer, L. A. and Mitchell, W. H. The Liberty Ships: The History of the "Emergency" Type Cargo Ships Constructed in the United States During the Second World War, Second Edition, pp. vii, 1-8, Lloyd's of London Press Ltd., London, England, 1985. ISBN 1-85044-049-2. ↑ Parker, Dana T. Building Victory: Aircraft Manufacturing in the Los Angeles Area in World War II, pp. 5, 7, Cypress, CA, 2013. ISBN 978-0-9897906-0-4. ↑ Parker, Dana T. Building Victory: Aircraft Manufacturing in the Los Angeles Area in World War II, p. 8, Cypress, California, 2013. ISBN 978-0-9897906-0-4. ↑ Rose, Patrick (2012). The Indian Army, 1939–47: Experience and Development. Routledge. ↑ Granatstein, Dr. J. L. (May 27, 2005). "ARMING THE NATION: CANADA'S INDUSTRIAL WAR EFFORT, 1939-1945" (PDF). Canadian Council of Chief Executives. Retrieved April 5, 2016. Colonel C.P. Stacey. "Chapter XIX Conclusion". Repatriation and Demoblization. The Canadian Army 1939-1945: An Official Historical Summary. This includes all German and non-German subjects serving within German Reich forces. Canada at War, "The Canadian War Industry"
Morgan, Eric B. "Albemarle" in Twentyfirst Profile, Volume 1, No. 11. New Milton, Hants, UK: 21st Profile Ltd.
Veterans Affairs Canada, "Canadian Production of War Materials"
Wikimedia Commons has media related to Military industrial production during World War II.